Simple design provides faster cleaning, more reliable cut offs, and cut ons. Cleaner operation-less soot. More reliable-fewer moving parts. Reduced motor load in start up. Higher Capacity - 4 GPH at 100 PSI. Reduced motor load; clean cut allows oil to freely bypass the piston, reducing the demands on the motor during startup. 12 to 240 volts replacement coils for CleanCut fuel pumps. Adds a brief, highly consistent "valve-on" delay to establish airflow and brings the pump up to speed for smoother light-offs. May be useful on some auto start pressure washers. The fuel pump moves the fuel oil from the fuel tank to the fuel nozzle. It is driven by the burner motor. 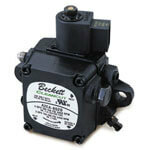 The pump uses a meshed gearset to squeeze fuel through the pump at about 100 to 200 PSI. 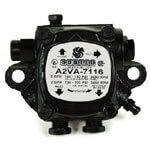 Pump pressure is read at the gauge port and adjusted with the pressure adjusting screw. Most fuel pump problems are due to either imporper installation or clogging with debris. Guaranteeing a clean, water free, fuel supply will do more than anything to prolong fuel pump life. Constant readjustment of pressure or other settings on the fuel pump will result in inreliable fuel pump action. IMPORTANT: The fuel pump is lubricated by fuel oil. running the pump dry or with water in the fuel will cause pump failure.